Wow. That is truly a beautiful gun + setup you have there. Wow. My job here is done. Readers of this post have the info they need to pursue their own decision concerning “cutting extra bolts” for their reg rec Uzis that have blocking bars in place. Im not here to argue. To each his own. For readers here....tread VERY carefully if you are following MT's line of thought on slotting additional bolts. Even if you own a reg. rec. 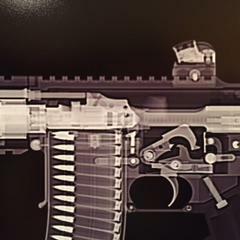 with a blocking bar I seriously doubt you can legally slot yourself additional bolts - both by atf regs and logic. I mean you could use those unreg. 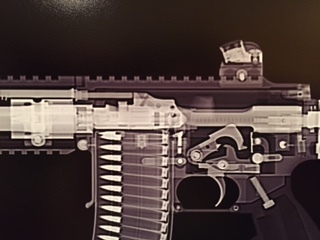 newly slotted bolts in semi guns and get fa fire, no? That would be an unreg. MG. the least desirable/ cheapest of Uzi family is the reg. rec with the blocking bar intact and thus its unreg. slotted bolt is indeed "married" to that one gun. As far as the Group Ind. and Vector Uzis-- the vast majority of them out there today have already had their demons exorcised and they are fine. But yeah a full properly converted IMI semi is generally thought to be the best and most expensive option. Note that there are various degrees of conversions of the semi IMI guns to FA reg. rec. All can still be done (say to finish out an incomplete conversion) with exception of removing the blocking bar. No way I'd ever slot new bolts under any circumstance. It's not like owning a reg. SBR AR15 lower and having a mess of short uppers for it. This Gun has been SOLD. I will now try to mark this thread as closed and sold etc. RL... I agree with all you said. The NFA is a community and while I'm not a soft heart touchy feely guy I do enjoy hearing and learning about the history of the hobby/profession we all love so dearly here. Not all of us were collecting/shooting before '86 and I do relish in the fireside stories of the pre 86 wild west of NFA where slab cracking amounts of 3 cent milsurplus 8mm abounded and barrels were smooth bored out on a regular basis. Mounds of spent casings beneath the tripods. And all the wild arse stories and personalities involved. Werner helped me out a LOT with very specific info concerning my AUGs and packs and whatever. He also helped me out a ton on optics including NV/Thermal. I really can't say I helped HIM out that much at all. I would absolutely welcome Werner's presence here or anywhere. Him gone off the grid has been a huge loss for us in the layman gun community. This cant be overstated. Now...I have no idea why he left or got kicked off "the other board"...I guess bc I'm not of the Protected Class or whatever and that's fine. I dont need or deserve an explanation. I do wish we had a more lively informative discussion forum here on Sturm. Oh and I for one really miss the old hardarse rules of posting items for sale. Loved seeing the smackdowns by Buddy and have gotten it myself at times. No problem. But man that made for clean quick previews of guns for sale. I loved it. First Machine Gun advice, opinions please. oh...if you are stuck on german...then get an MP5...whether it sear gun or a registered receiver depending on the type of collection you want to build. EVERYONE loves shooting an MP5. Cant go wrong. Makes for an excellent 1st or 2cd MG although they are expensive as heck of course. for your first machine gun I'd rec' something more basic...say a $7,000 Mac (w a Lage upper) like a M11/9 or depending on your budget say a $12,000 Uzi or a $19,000 M16/AR15 or a $15,000 FNC. I would def. NOT rec' jumping straight into a high end old collector beltfed like a MG42 which run $50,000 or so depending. Belftfeds are hard. If you feel the need for a beltfed then go with a 1919a4 for about $16,000 to learn the ropes. I wouldnt go with a STG 44 for a first gun either. The main problem is that you are new to MGs and the most difficult purchase assessments are centered on the style guns you mention above---bc things like matching serial numbers etc mean huge FMV swings in price. Instead just buy something more mainstream and not susceptible to you as a new buyer being screwed badly. Want to get screwed badly anyway? then buy a beltfed not knowing anything about beltfeds. Dont do it dude. Mac, Uzi, FNC, M16, .... oh and make sure you fully understand the amount of money you're looking at (and feeding the gun if you are a high volume shooter) and have a budget. Your budget will help you narrow down your first MG.
Hmmm.... I know of Dan Dolan in NM. In fact I purchased an Uzi from him maybe 10 years ago. Gun was delivered etc , no big issues. From that conversation I remember Dolan as being an environemntal atty in NM and being a collector of tanks and whatnot. TV shows used them etc. The Dan Dolan I dealt with back then is a nice reasonable guy. I have a hard time believing this ad was posted by the same guy. -Houston " Sorry for late reply - been on extended vacation redoing a vacation home. Yes I do have - cannot post/host them here - send me an email to drd@lobo.net and I will send you several emails with Hi Resolution photos of the HK21...call me at 505-269-2056 and I will tell you more.....send email ping & I will send bunch of photos of the rifle.....Ralph did a super job....as usual. RDTS build the rifle with HK original German parts bought 15 years ago when avaialble in quantity and Michaels Machines installed the belt feed roller and belt feed and box.....also German HK parts. Dan Dolan "